Calling all Frankston-based music lovers - The Pier Street Party is officially set to shake up Melbourne’s outer suburbs once again on February 24, 2018. For the second year running, the outdoor festival will be jam-packed with incredible music and summertime fun for all. 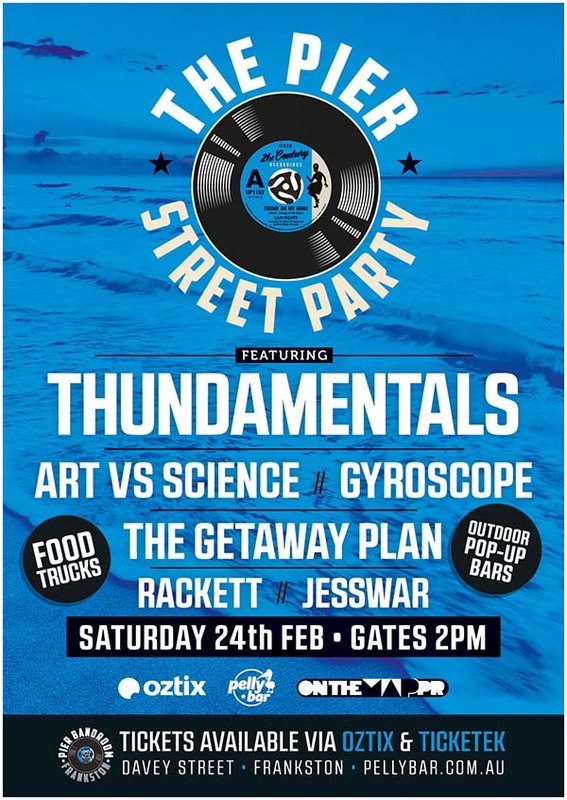 Headlining the street party will be Sydney hip hop superstars Thundamentals, with support from a heap of Aussie legends Art vs Science, Gyroscope, The Getaway Plan, Rackett and Jesswar. Held outside The Pelly Bar & Pier Bandroom in Frankston, this epic street party will be the talk of the summer. Bringing the local community and music fans together for such an unmissable lineup, The Pier Street Party is guaranteed to set the example for Aussie summer festivals to come. Thundamentals have had an absolute corker of a year, with the release of their fourth studio album Everyone We Know and the newly announced Decade Of The Thundakat national tour, plus a massive festival run scheduled for this summer. Art vs Science will be smashing through their latest single Wickoo and some older fan faves. Gyroscope will be right there alongside them ahead of their 2018 national tour playing their first studio recording since 2010 – their new double A-side Crooked Thought and hits from albums past. In just one year, loud and experimental pop-punkers, Rackett have gone from virtual anonymity to playing major theatres and festivals throughout Australia, making waves with their debut EP Ready or Not. The Getaway Plan had a busy year on the road, supporting Alexisonfire and recently wrapping a national tour of their own. And independent Brisbane-based hip hop artist Jesswar will bring her touring chops to the stage, having been busy sharing stages with 360, Tkay Maidza and Allday. Masterminded to bring the community together to enjoy a day of world class music; The Pier Street Party team have put together a killer lineup at a very accessible price point for punters.